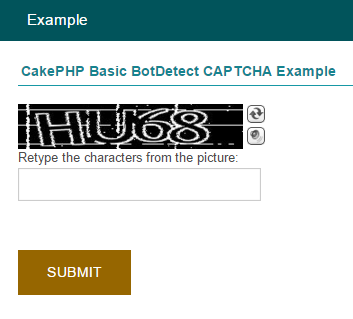 This code example illustrates the most basic form of BotDetect PHP Captcha protection in CakePHP MVC applications. Check the BotDetect CakePHP 3 Captcha Quickstart for key integration steps. The files are available for download as a part of the BotDetect Captcha CakePHP integration package. In order to use the CakePHP CAPTCHA Plugin, we have declared Captcha configuration which will be used when loading Captcha component in ExampleController. Detailed description of this approach is available in a BotDetect CakePHP 3 integration guide. The above code uses the CakePHP FormHelper to generate a form, although the actual form can be created in many other ways. The only requirement is that the form contains an input field of your choice where the user can retype the characters shown in the Captcha image. This user-entered code should be available to you in Controller code after form submission. We display the image by calling the captcha_image_html() helper function. The View utilizes the HtmlHelper::css() method to add the required stylesheet, and it also prints out a message about the Captcha validation status (set in the Controller). The example Controller follows the basic instructions from the BotDetect CakePHP 3 integration guide. After loading the BotDetect Captcha CakePHP component, the example form submits the data to the same Controller action that shows it (index), which is where we check the submitted data and pass it to the captcha_validate() helper function.